Ultrasonic: sounds that humans cannot hear. Echolocation is the use of sound waves and echoes to determine where objects are in space. Bats use echolocation to navigate and find food in the dark. To echolocate, bats send out sound waves from the mouth or nose. When the sound waves hit an object they produce echoes. The echo bounces off the object and returns to the bats' ears. Bats listen to the echoes to figure out where the object is, how big it is, and its shape. Using echolocation, bats can detect objects as thin as a human hair in complete darkness. Echolocation allows bats to find insects the size of mosquitoes, which many bats like to eat. Bats aren't blind, but they can use echolocation to find their way around very quickly in total darkness. Bat echolocation, visualized. The sounds that the bat makes are represented by the yellow sound waves; the purple sound waves show the sound waves that are reflecting off of the moth. 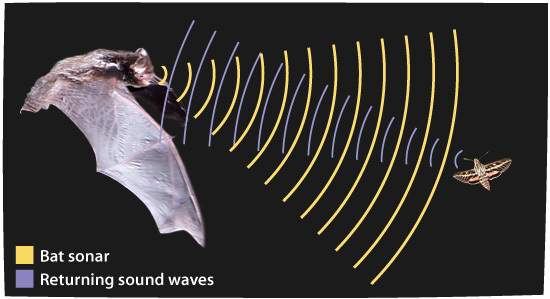 The bat uses these returning sound waves to figure out the location of the moth. What Sounds Do Bats Make? The following image shows the sonogram of a silver-haired bat screech from the Western Ecological Research Center. 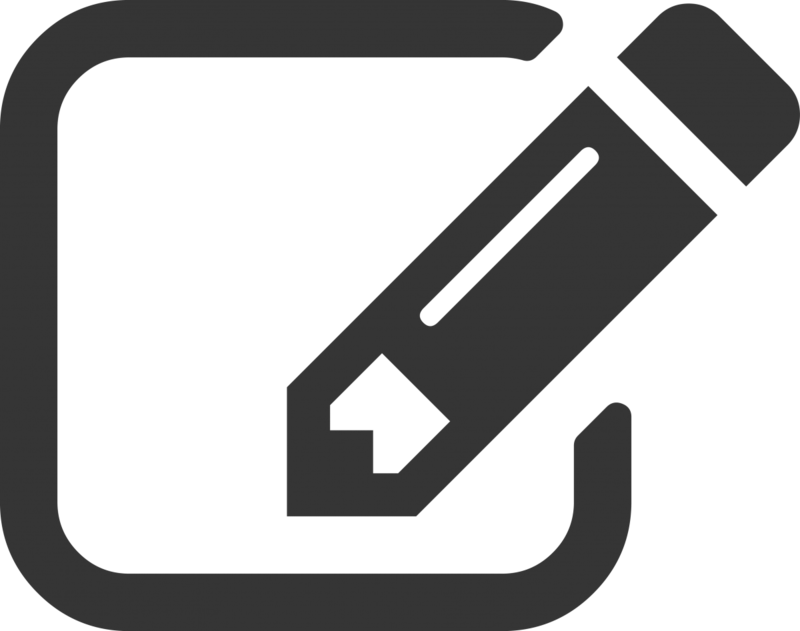 In this recording you can hear a standard repeated call that is for basic navigation. Bats use this to avoid flying into objects. The faster clicking is likely because the bat has detected an insect and the bat needs more accuracy to catch its prey. You can use the player below to listen to the call or get the mp3 file here. 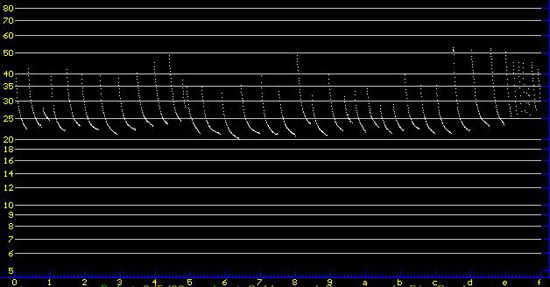 A sonogram, or sound graph, showing the screech of a silver-haired bat. Did you know that other animals use echolocation too? Dolphins, whales, shrews and some birds use echolocation to navigate and find food. There are even some blind people that have learned to use echolocation to navigate within their surroundings. Humans cannot hear ultrasonic sounds made by echolocating bats. But there are some insects that can hear these ultrasonic sounds. These insects include some moths, beetles, and crickets. When moths hear an echolocating bat, some will turn and fly away. Others will start flying in a zigzag, spiral, or looping pattern to avoid being eaten by the bat. Some crickets and beetles are known to make clicking sounds that startle the bat and scare it off thus avoiding being eaten. Did you know that the scientists that developed the sonar and radar navigation systems used by the military got their idea from studying bat echolocation? Just like bat echolocation, sonar uses sound waves to navigate and determine the location of objects like submarines and ships. Only sonar is used underwater, while bats echolocate in the open air. Radar uses electromagnetic waves to determine the location of objects like planes and ships. Like bat echolocation, radar is also used on open air. 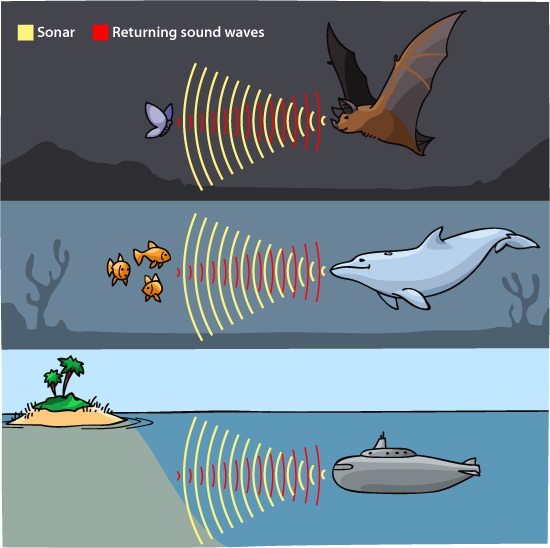 Sound waves and sound reflection is used by bats and dolphins to echolocate; this process was studied and used to develop underwater sonar that we use in submarines and other water vessels.